What will the city traffic of the future look like? In the exhibition Ride a Bike! Reclaim the City, the German Architecture Museum in Frankfurt shows why there is no way around the bicycle. Cities are growing bigger and more packed all over the world: since 1950, the urban population has doubled, and since 2007 more than half of humanity lives in urban centres. The UN estimates that by 2050 the figure will be two-thirds. To make city life worth living, it takes a lot of space – squares, green and open spaces. But especially traffic routes in often old city centres are already reaching their limits. The exhibition Ride a Bike! Reclaim the City at the German Architecture Museum in Frankfurt shows why bicycles could be the means of transport of the future, using the example of cities such as Copenhagen, New York, Karlsruhe and Oslo. An interview with the curators Annette Becker and Stefanie Lampe. “Reclaim the City” – its subtitle makes the exhibition sound like it’s about returning to a state that once existed. Is our future in our past? Annette Becker: “Reclaiming” refers in essence to the available space. I recently saw a nineteenth-century oil painting depicting a street in Paris that is still in use today. On this big street drives a coach. Just one. Many of our roads are constructed for traffic at the end of the nineteenth century. But in the meantime a lot has changed. It’s in this sense that the exhibition is about a reclaiming, namely of space. The transport researcher Barbara Lenz has written that “reclaiming” sounds almost like a military campaign. Becker: It’s not about lobbying for cycling. But we noticed something decisive when we looked through the many international projects for a contemporary mobility: cycling is a seismograph of urbanity. If you can cycle well in a city, if there are good bike paths and enough green space, it’s an indication that the city has a high quality of life. That’s why it seemed to us to make sense to push a bicycle-friendly city. What is the mood about this in German society: Is there a consensus that a bicycle-friendly public space is what we want? Becker: It’s not an issue which directly interests everyone. Many people are particularly interested in how they can manage their own personal mobility as well as possible. But of course that’s no way to develop a city, a community. I’d say there is a consensus that we have to improve our mobility in some way – at the latest when you have to drive into the city every morning in a long traffic jam. Stefanie Lampe: Moreover, most cities are growing; the twenty-first century will be called the century of the cities. Everyone in his own car – that’s simply no longer an option for today's traffic. Numerous citizens’ initiatives such as “Radentscheide” (Bike Decisions) show that more and more people have realized something must be done here. At the “Radentscheide” in different German cities, committed citizens demand an improvement of the bicycle traffic. In Berlin they’ve already put through a first bike law. It was passed in 2018 and stipulates that the city must promote cycling. Becker: It’s not our aim to demonize cars. We’re interested in peaceful coexistence. But the crucial moments of this peaceful coexistence take place in our street spaces – and you can’t make them bigger. What other arguments besides the space problem speak for the bicycle? Becker: It’s quick and easy, and it’s fun. Lampe: It’s healthy and quiet. And finally, the environment. But admittedly, it’s not the environmental aspect that gets people on a bike. Polls in bike cities like Groningen and Copenhagen show that people take to bikes because they are the fastest and most convenient means of transport, at least over shorter distances. Let’s talk about aesthetics: Will the cityscape be more beautiful if public space is shaped more by the bike? Lampe: We think it would make public space more beautiful, yes. I believe we’ve found good examples to show this. As an architectural museum, it was important for us of course to showcase high-quality creative construction projects. Are there any of the eight examples from Europe and other regions selected for the exhibition whose aesthetics really inspires you personally? Becker: Barcelona. The Boulevard Passeig de St. Joan is just incredible. 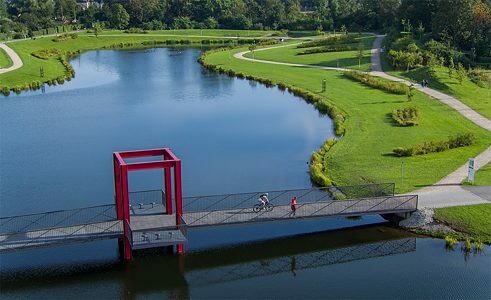 In this project city planning, traffic planning and above all landscape architecture come together in an exemplary way and create new, high quality recreational areas. With plenty of seating, new green areas and playgrounds, public space is upgraded for everyone, not just cyclists. There are cities that always play a leading role in design issues and Barcelona is definitely one of them. The term “public space” is also philosophically charged in Germany. Philosophers such as Jürgen Habermas and Hannah Arendt have examined publicness as a political factor. Simply put, if fewer people drive around in cars, shut up within their own four walls, what does this mean for social communication? Lampe: We definitely see the potential for change. The bicycle is also a socially aware means of transport. When I’m riding a bike I’m not enclosed in a steel capsule, I’m interacting with the space and the people around me. I experience urban space physically and differently, perceive it differently. This also has to do with the changed speed: the faster I traverse a space, the less I perceive of it. 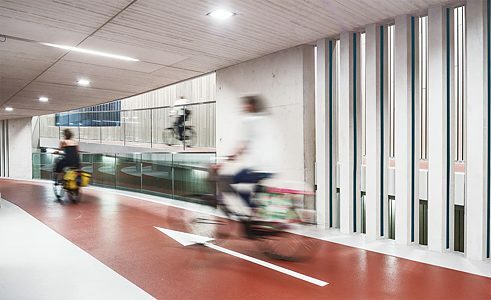 The first bicycle highway in Germany is 101 kilometres long and connects the cities of Duisburg and Hamm in North Rhine-Westphalia. With a minimum width of four metres, there is room for both cyclists and pedestrians; the slopes are negligible. 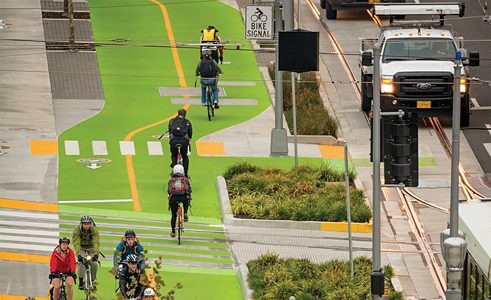 The new light rail system, which has been running from US Portland to Milwaukie since 2015, is lined with about 12 kilometres of cycle and footpaths. 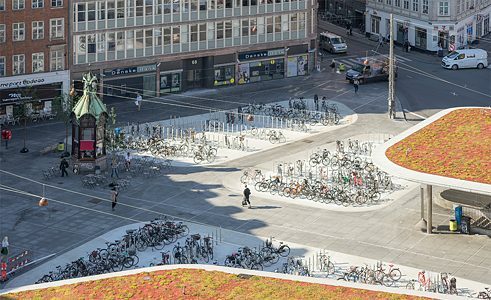 The new station forecourt of the Nørreport Station in Copenhagen, Denmark, offers plenty of open space and room for 2,500 bicycle parking spaces. 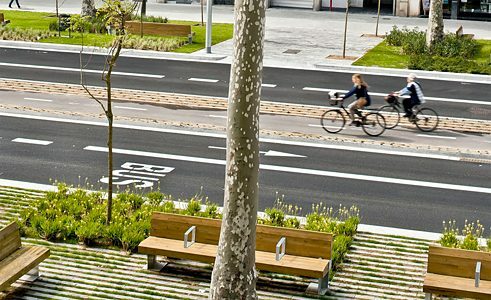 The Passeig de St Joan in Barcelona, Spain, was rebuilt mainly for pedestrians and cyclists, with plenty of seating, green areas and playgrounds. 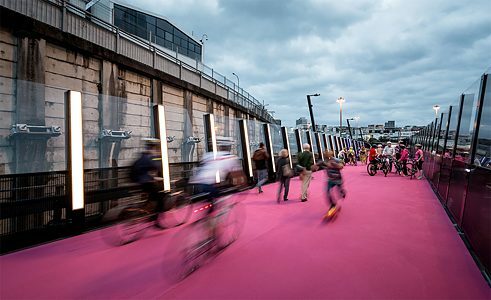 The Lightpath in Auckland, New Zealand, transforms six hundred metres of highway infrastructure into an inner-city cycle path. 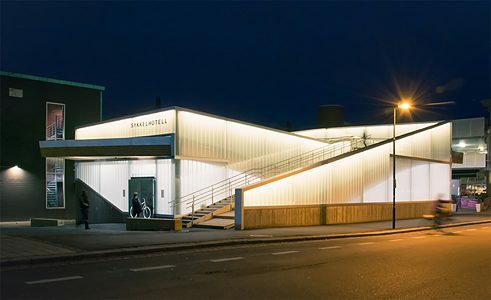 In the Norwegian city of Lillestrøm, the Sykkelhotell bicycle parking garage provides space for 394 bicycles on 500 square metres. 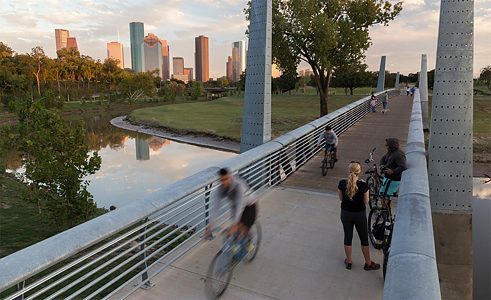 The Buffalo Bayou Park in Houston, USA, is an urban oasis: the 64-hectare park with over 14,000 trees is also an important urban flood protection channel. 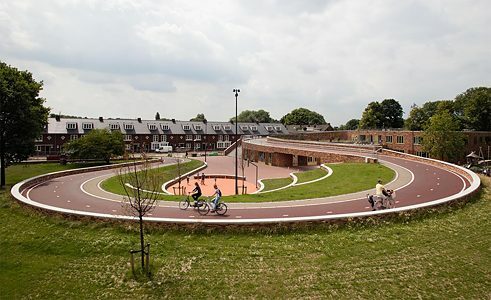 The area of the approximately 100-metre-long Dafne Schippers Bridge in Utrecht in the Netherlands provides space for a bridge, a primary school and a public park. 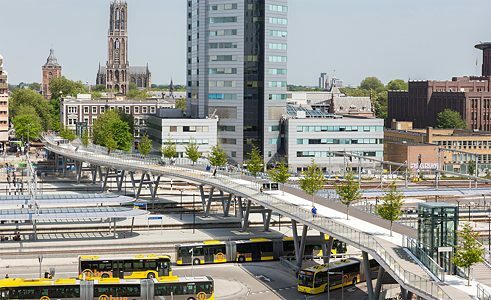 The 312 metre-long Moreelse Bridge in Utrecht, Netherlands, connects the eponymous park and the Old Town in the west of the city with the growing district and the new business quarter in the east for pedestrians and cyclists. The bicycle parking garage at the Utrecht train station will be completed by the end of 2018 and provide space for 13,500 bicycles. Judith Reker is a freelance journalist based in Frankfurt am Main. Copyright: Text: Goethe-Institut, Judith Reker. This work is licensed under a Creative Commons Attribution – Share Alike 3.0 Germany license.